Kazakhstan, one of the largest countries in the world, was long hidden from the West—first under Russian tsarist rule and then behind the Soviet Iron Curtain. After gaining independence in 1991 the country continued to remain unnoticed among all the “stans” of Central Asia. Now, twenty years on, it has emerged as a modern state with far-reaching ambitions. Free-market reforms and rising oil exports have made Kazakhstan the richest country in the region. It has a vibrant economy, a stable business environment, and a friendly social scene. There are many contrasts and extremes in Kazakhstan. You may find some of the apparent contradictions bewildering—not least, Asians speaking Russian, who follow a mixture of Muslim, Soviet, and earlier pagan traditions. This book sets out to introduce you to this complex, unknown nation. It guides you through its history, traditions, and social values so that you will be able to identify the signs of its Soviet totalitarian heritage, of Russian cultural influence, and of the Asian mentality with its deep respect for power and hierarchy. It tells you about the Kazakhs at work, at home, at leisure, and in the street; it describes how they celebrate their holidays, and what they eat and drink. Whatever your reason for visiting, whether for business or travel, Culture Smart! 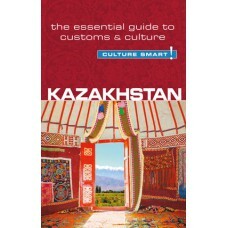 Kazakhstan will help you make the most of your trip.